Once upon a time, I used a lot of chemicals in my home and personal care products. One of my mainstays was bleach. Living in the country in a humid climate, we always had that musty odor you get in the basement and it would permeate our home. I also used bleach to brighten our clothes in the wash.
One day, I learned that bleach is very unhealthy for the lungs and for the thyroid. Oh my! A light bulb went on in my head! 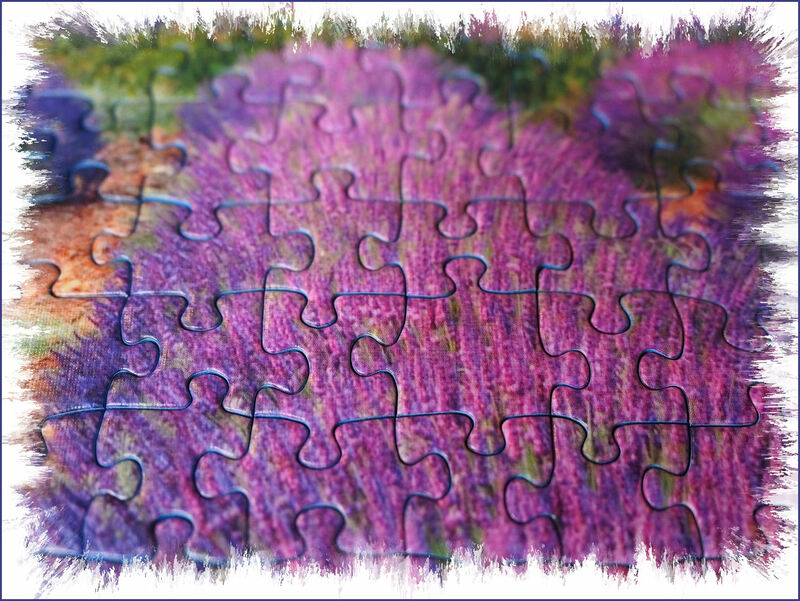 Two health challenges I was battling involved my lungs and my thyroid. So, I decided to do some more research. Fortunately, I had a lot of friends who also were interested in natural and healthy lifestyle choices. They told me how to get in the habit of reading labels and about the Environmental Working Group website where you can look up ingredients. I was horrified at the amount of toxins I was allowing in our home and bodies. I started to learn about bottle swapping. Gradually, when a toxic cleaning product I had been using would be empty, I would replace it with a “clean” product. Over time, I eliminated and replaced so many products that I ended up with more room in my cupboards. The reason was that I discovered a whole line of products made by Young Living Essential Oils. All the products are based on the Thieves blend, which is a whole different story. I have written several articles about Thieves, so you can search “Thieves” and read up a bit more as you have time. But let me get back to the story! The first product I discovered to help my cleaning dilemma was Thieves Household Cleaner. Words can’t describe my delight at how well it worked and how inexpensive it was. Now, I use it for everything! Floors, dusting, counters, kitchen, bathroom, mirrors and windows, and even tough jobs like getting spots out of clothes, and cleaning the house siding, carpets, cars, and more. 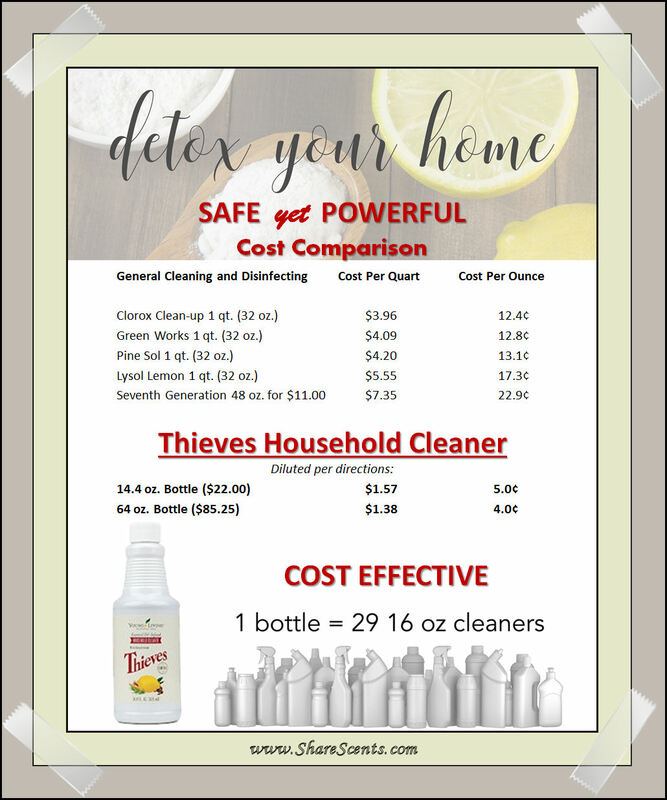 Check out this cost comparison to see how cheap it is to clean safely and effectively! Over time, I discovered the Thieves Laundry Soap, Dish soap, Hand Soap, and many other products in the Thieves line. I get rather passionate about the difference the Thieves products have made in my life. My house smells amazing and my lungs and thyroid are so much happier now that I have eliminated so many toxic chemicals from our home! If you want to learn more about these products, check out this link on my website. Everyone knows that the things we put in and on our bodies have an impact on our health. The problem is, often we are clueless to know what we are consuming. If we resort to reading labels, we can quickly become discouraged by the big words we see in little very tiny print! I mean really… Like what exactly is Benzalkonium Chloride anyway? And does it even matter? And why is it such tiny print? I have actually looked up some of these big words and it really depressed me. I found out that a lot of the common ingredients in personal care products could be causing all sorts of problems in my body. Cancer. Weight gain. Mood swings. Headaches. Digestive issues. Rashes, and more. But it seemed like certain ones that are proven to be harmful are in pretty much all these types of products. And to add insult to injury, then I found out that because of “trade secrets” not all ingredients even have to be listed on the labels, or they can use vague terms like “fragrance” to hide the truth from you of what is in there. So how do I know what really is in the bottle I am buying? There are a lot of lists out there of ingredients to avoid in our home and personal care products. I have included a partial list (along with some of the challenges these ingredients bring to our bodies) in my Women’s Personal Care newsletter, so just get your mitts on a copy and you will be amazed! But I digress. This rude awakening about ingredients that could be creating problems in my body led me on a search for companies that provide “full disclosure” and that hold to the highest ethical standards and integrity. I continually update my list of companies that I trust, but one company continues to hold the top position on my list. That is Young Living Essential Oils. I have been using their products for 18 years now and I just feel better and better all the time! Not only does Young Living offer essential oils, but their extensive product line includes powerful supplements, nutrition and food items, home and personal care products and more. It’s like one-stop shopping I can trust and quite economical in the long run. And trust me, I’m in this for a long run! I challenge you to check out my newsletter and website and see what I discovered long ago. Then let’s have a conversation. that was offered in this blog post! These statements have not been evaluated by the FDA. Information, products and/or techniques mentioned is provided for educational purposes and not intended to diagnose, treat, cure or prevent any disease. Consult with the health authorities of your choice. The decision to use, or not to use, any of this information is the sole responsibility of the reader. The author assumes no responsibility to or liability for any loss, damage or injury resulting from the use or misuse of any information provided here. It seems like cancer of all types is on the rise. Hardly a week goes past when I don’t learn of another friend or acquaintance who is battling cancer. It always sets me to thinking about what factors contribute to the root causes of various types of cancer. A person only needs to spend a few minutes looking up ingredients found in common personal care products to realize that we are subjecting ourselves to a plethora of dangerous chemicals on a daily basis if we are not intentional about the choices we make. Recently I read an article that discussed an ingredient that is commonly found in shampoo. This ingredient is a class 2 carcinogen known as cocamide diethanolamine (cocamide DEA). Let me take a small rabbit trail here! We should not confuse DEA, with DHEA (Dioscorea villosa), which is derived from wild yam and is a hormone precursor for progesterone. 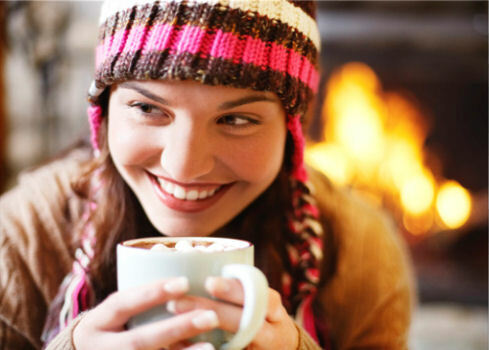 DHEA is commonly considered safe. On the other hand, DEA is “a viscous liquid and is used as a foaming agent in bath products like shampoos and hand soaps, and in cosmetics as an emulsifying agent” (Wikipedia). The Center for Environmental Health filed a lawsuit in 2013 against a number of companies that sell products containing DEA, stating “Most people believe that products sold in major stores are tested for safety, but consumers need to know that they could be doused with a cancer-causing chemical every time they shower or shampoo.” CEA found cocamide DEA in store-brand products purchased at Walmart, Trader Joe’s, Pharmaca, and Kohl’s. A list of products and brands can be found at this link. 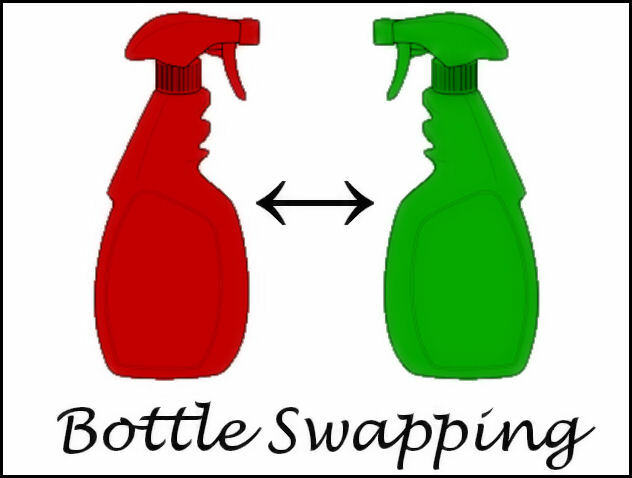 I have access to an amazing recording called “Dangers of Chemicals” that really helped me understand just how important Bottle Swapping is. I would gladly share this recording with you if you are interested. Please send me an email and I can get you access to this private recording! This is just a short list, but if you started reading the labels on all these items, and did a little research, I believe you would be shocked — maybe enough to make some changes. The problem is where do you start? My recommendation is one bottle at a time! 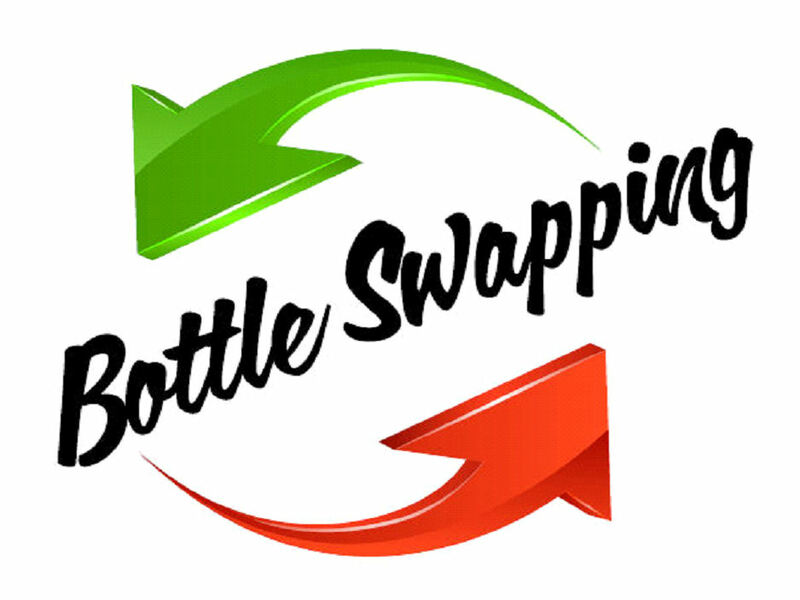 Start doing what I call bottle swapping. When a product you currently use is running low, replace it with a healthy alternative. That is what I did. It took a while, but it really did pay off. How do you know what is a good replacement? Who can you trust? For me the solution is to know your source. Know the company you are dealing with and the integrity of its products. The company I have grown to trust over the years is Young Living Essential Oils. Did you know there are hundreds of products in their catalog and every single one is healthy and pure? You will find replacements for so many things that you already use on a daily basis. But the best part is you can be rewarded for your purchasing loyalty with the opportunity to get hundreds of dollars in free products that you select to match your family’s needs. Curious enough to want to check it out? I would love to help you learn more about how to save money and start “bottle swapping” for your health! Please contact me for more information. Recently I traveled to Los Angeles to visit family. For several days the air quality was very poor. My eyes and throat were burning from the heavy layer of smog hanging in the atmosphere. One morning when it was particularly irritating to my eyes, I decided to diffuse Purification Essential Oil Blend from Young Living Essential Oils. Within minutes I noticed my eyes stopped burning and the air seemed to smell much better in the house. That reminded me of another DIY blend that is very refreshing. It is called Forrest Air Freshening Blend. The basic recipe I use is 5 drops Idaho Blue Spruce, 3 drops Lavender, 3 drops Eucalyptus Radiata, and 2 drops Cedarwood. There are a couple of ways to use this blend. You can mix a batch of the blend and then diffuse small amounts in your favorite diffuser. If you want to make a larger batch, simply multiply the individual ingredients by 10 and store in a 15 ml glass bottle. Be sure to label the bottle with the contents and recipe so you know what is in the bottle and can easily refill it later. Another way to use this blend is to add the drops of essential oil for a single batch of the blend to a 2 ounce glass spray bottle and fill the rest of the way with Vodka. This makes an excellent room freshener to spray in the bathroom! Now, maybe you are not partial to the scent of Purification or to a forest scent for freshening the air in a room. That’s OKAY! Just pick a single oil or blend that you enjoy and diffuse it or put about 20 drops in a glass spray bottle, add Vodka and spray away! Be sure to always shake that bottle before spraying. I hope these ideas inspire you to freshen up the air in your home! If you have a favorite scent to diffuse, please share it! What are you using to clean the surfaces in your kitchen? Drug-resistant bacteria can spread very easily in your kitchen and most of the cleaners that are commonly used do not kill these bacteria. Most have deadly chemicals that cannot be pronounced. Who knows what toxic overload you are placing on your body when you do dishes and prepare your meals? That’s why I rely on Thieves Household Cleaner and Thieves Spray in my home. Often people find that when they try a “natural” cleaner they sacrifice the cleaning power. And even worse, often there are toxic chemicals that are not disclosed on the label. Thieves, on the other hand, is a powerful cleaner, and there are no hidden toxic ingredients. Thieves Household Cleaner has the coveted “green rating” from the Environmental Working Group. That is very reassuring to me. Especially since it works! It is even safe enough to use to wash my fruits and veggies. And I never need to wear gloves! 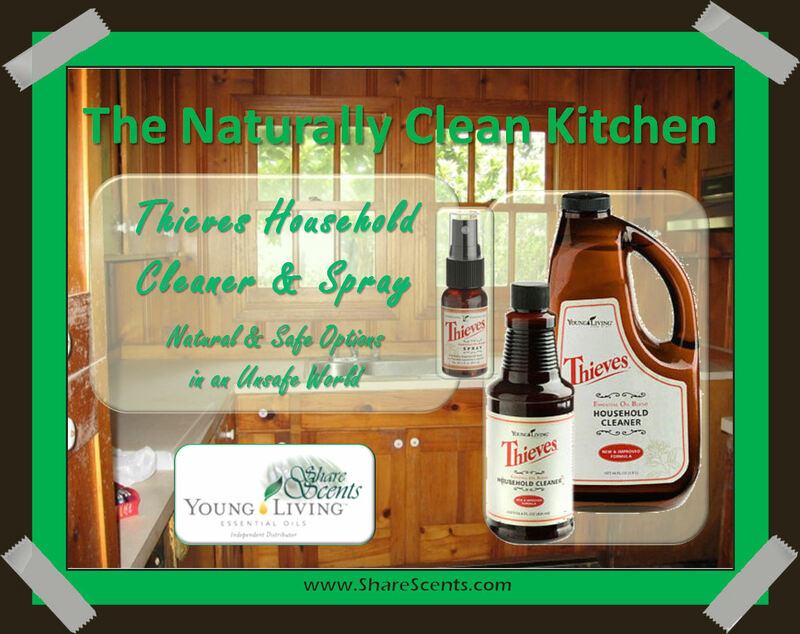 So if you are looking for a safe alternative for use in your kitchen that will not create drug-resistant bacteria, check out these two products: Thieves Household Cleaner and Thieves Spray.